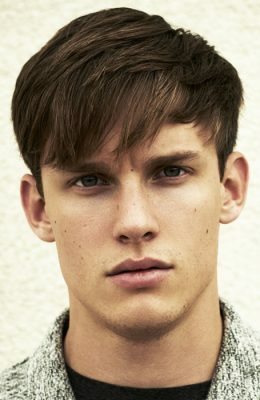 Fortunately for the majority men, hair that hits the mid-point in thickness as well as length is the ideal scenario. “Around 80 per cent have medium-weight hair, and growing this is the perfect way to enhance its natural texture,” adds Steve Robinson from multi-award-winning salon chain Electric. Whether yours is straight, curly or afro, the type of medium-length hairstyle you go for will be dependent on factors such as your overall style, face shape and hair type. For a low-effort, high-style cut that leans towards the shorter side of medium, it’s hard to go wrong with a tight back and sides. With this, leave enough length left on top to work through some product for a look that was as relevant in your granddad’s day as it is yours. Alternatively, for a look that will fly in just about any office, plump for a pompadour. The style made popular by Elvis during the 1960s has enjoyed a massive resurgence in recent years, with variations ranging from the classic to tapered. If texture is the ultimate aim, a tousled top – capable of being worn up as a loose quiff or down with a fringe – is an razor-sharp choice. Just be prepared to meet an avalanche of hair products every time you open your bathroom cabinet. Whichever you go for, there’s no longer a need to feel stuck in a middle-ground with this length. And if you need some more inspiration, here are some of the best cuts out there so you’re never caught short. Don't know if you're an oval or an oblong? Our easy to follow guide will help figure out your face shape once and for all. The sharpest cuts and how to keep them, for every kind of hair known to man. From Cary Grant to George Clooney, the classic side part has been the toast of Hollywood since the beginning. You lucked out. Here's how to make the most of it. Because going bald isn't the only styling headache a man can have.